Anthony Faiola recently spent time in Rwanda and discovered that women are restarting the country’s damaged coffee industry and in the process helping to provide much needed economic stability. He recently discussed his trip on NPR’s Tell Me More. More than a decade ago, nearly a million people died in the Rwandan genocide. The violence claimed so many men’s lives that it left a gender imbalance that endures today. But that also provided the opportunity for many Rwandan women to take the reins of their country. Washington Post reporter Anthony Faiola discusses Rwanda’s new female leaders. The most interesting part of Faiola’s message is that Rwanda has been successful because they have empowered women. In a society that used to live with rather traditional African roles, if they had remained unchanged by the genocide, they would likely be struggling with an even greater range of issues. This is not to belittle the immense problems they are currently having, particularly with engrained prejudices, but clearly one of the biggest challenges in a post-genocide region is economic recovery. Without it, a country is far more likely to destabilize and fall back into violent patterns. If you’re reading this, it probably means you’ve been to my old site and followed the link here. As I said there, I’ve been meaning to migrate to my permanent domain for almost a year now, but with work demands I’ve had precious free time lately. I’ll have to confess, I don’t know the answer to that. I know that the issue was under very active consideration. I think there was a strong disposition within the department here to view what has happened there, certainly, constituting acts of genocide. I have guidance which I try to use as best as I can. There are formulations that we are using that we are trying to be consistent in our use of. I don’t have an absolute categorical prescription against something, but I have the definitions. I have phraseology which has been carefully examined and arrived at as best as we can apply to exactly the situation and the actions which have taken place. The simple fact is, despite all of Lemkin’s hard work, the genocide convention has always been a faulty mechanism, which is backed by sovereign powers only as needed to excerpt policy forces where they’re advantageous. As Jonah Goldberg reported in the Los Angeles Times recently, this type of political maneuvering has recently reared its head in Russia, where the lower house of parliament passed a resolution stating that the Ukrainian famine wasn’t genocide. Virtually no one, including the Russians, disputes that the Soviet government was involved in the deliberate forced starving of millions of people. But the Russian resolution indignantly insists: “There is no historical proof that the famine was organized along ethnic lines.” It notes that victims included “different peoples and nationalities living largely in agricultural areas” of the Soviet Union. As Goldberg points out, the distinction the Russians are attempting to make (which many others have attempted to make in the past), is that the victims of this genocide were not an ethnic or religious group, but simply a bunch of people who happened to be living in an area that was decimated by a violent act. He goes on to explain that Lemkin made a number of concessions in order to get the convention passed, after years of fighting for its adoption. The Russian’s argument, of course, like Turkey’s anti-Armenian lobby, is nothing but a semantic dodge. It’s the same kind of dodge Mike McCurry and Christine Shelley made in order to keep the Clinton Administration shielded from having to take action in Rwanda. And while I agree that this is a loophole that needs to be closed, I can’t help but notice that the United States and her sister nations have plenty of other excuses to ignore genocides, including, unfortunately, those that are currently unfolding. 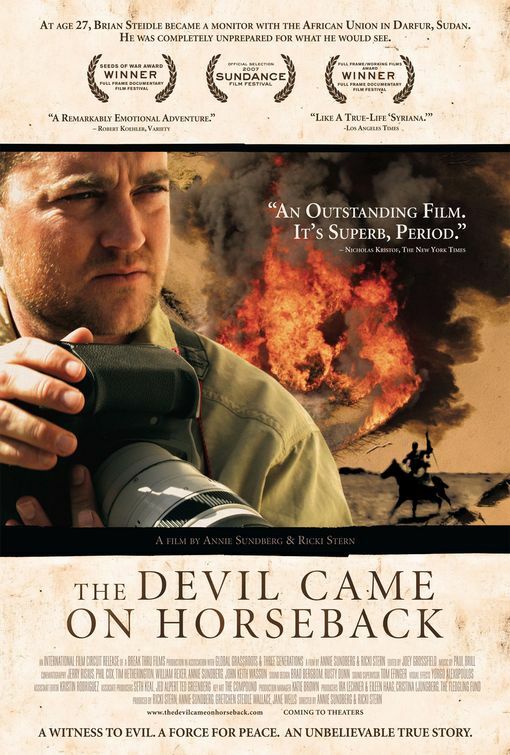 Next Sunday, April 6, the Virginia Holocaust Museum will present a free screening of the award winning documentary The Devil Came on Horseback at 2 p.m. The film chronicles the tragic genocide currently taking place in Darfur through the eyes of former U.S. Marine Captain Brian Steidle. The screening will be followed by a question and answer session with Jane Wells, one of the film’s producers. For more information, visit the VHM website.